What a great w/end we had in Ardara just gone by. 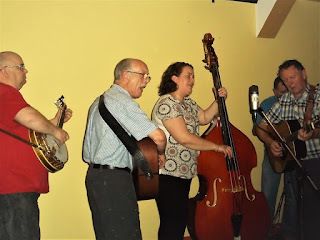 With almost an all-American lineup it was down to us to represent Irish bluegrass and we hope we didn't let anyone down with our performance at the Sun. night concert when we shared the stage with Lorraine Jordan & the Garrett Newton Band and Jeff Scroggins. A big thank you to Mel Corry & Des Crerand for joining us over the w/end. Congrats to Pat McGill for a wonderful 10th festival and thanks for having Woodbine play all 10. Looking forward to 2018. The photo above, showing (l-r) Mel Corry, Liam Wright, Nicola O'Brien Kennedy, Des Crerand (partly hidden) and Tony, dates from 2016, though the lineup is the same as for this year's Woodbine set. Photos from the 2017 festival are awaited. More photos are on the Garrett Newton Band Facebook.